Stessa is a web-based platform for property investors to manage, monitor, and communicate the performance of real estate portfolios. The software helps real estate professionals with reporting dashboards, security, tax-ready financials, expense and income tracking. From adding properties and connecting accounts to assessing performance metrics and running financial accounts, Stessa helps in managing the entire real estate portfolio. Stessa's primary features include visual dashboards for monitoring key metrics, an iOS app to capture and scan property-related invoices and paper receipts, and an automated expense tracker to categorize and consolidate transactions from loan and banks. Additionally, Stessa also provides a personalized investment dashboard, LP communication tools, and automated receipt scanning. Stessa integrates with AppFolio to automatically import transactions every month. Support is provided via online help desk and email. Two thumbs up for Stessa: What-gets-tracked-gets-improved made easy. Awesome. Well worth the time inputting​ the data.Ease of use: It works the way it should. Automation: Once set up, the transactions of the download from owner each owner portal (when you own several properties), and bank accounts. User experience is similar to mint.com. Visibility: it creates a consolidated dashboard for the portfolio, and derivative clean graphs, giving perspective and showing trends. Amazing Customer support: hats-off to the reps, who have answered 10+ "hard questions". I only ask "hard questions" since the FAQ is also excellent. - Insightful newsletter. Ease of use: It works the way it should. Automation: Once set up, the transactions of the download from owner each owner portal (when you own several properties), and bank accounts. User experience is similar to mint.com. Visibility: it creates a consolidated dashboard for the portfolio, and derivative clean graphs, giving perspective and showing trends. Amazing Customer support: hats-off to the reps, who have answered 10+ "hard questions". I only ask "hard questions" since the FAQ is also excellent. - Insightful newsletter. No Cons per se. Just two humble recommendations. Users of Stessa would benefit tremendously if it: - it offered a function for marketing the property (i.e. find tenants or buyers). Stessa being a repository of information (location, yr built, sq footage, pictures), a few clicks should allow spreading​ the good news throughout the specialized sites (Craigslist Zillow, Trulia, Redfin, local websites...) - kept historical records of the tenant roll. Currently, it only offers a picture at the present time. Holistic view of the property valuation and cash flow. Tracking expenses and providing required profit and loss for accounting. Quick and ease setup. Interface is designed for property managers - provides accounting and bookkeeping using the terms familiar to property managers and owners. Easy to track the expenses and capture everything for expense allocation and audits. Quick and ease setup. Interface is designed for property managers - provides accounting and bookkeeping using the terms familiar to property managers and owners. Easy to track the expenses and capture everything for expense allocation and audits. New product that is still missing some features. Have to jump through some hoops to account for sold properties. Phenomenal. I've working in management consulting implementing technology systems for years and know what a pain it can be to transition data to a new system - and this experience has been nothing short of awesome. I am thrilled not to be using my Excel pivot table reports or having to manipulate Xero, Wave, QBO, Netsuite, etc. to fit my needs as a real estate investor. Really, incredible strategic move on Stessa's part and we are thrilled end-users.Ease of use, integration with current banking systems, and focus on real estate investors. I was planning to drastically manipulate Quickbooks to make it work like Stessa - Stessa basically eliminated all of that work AND has a gorgeous user interface compared to QBO or my rigid Excel sheets! Ease of use, integration with current banking systems, and focus on real estate investors. I was planning to drastically manipulate Quickbooks to make it work like Stessa - Stessa basically eliminated all of that work AND has a gorgeous user interface compared to QBO or my rigid Excel sheets! Some features are still in the works (e.g. they just implemented new functionality to demonstrate sale proceeds from a flip, and are working to integrate to reporting) - but that's it. Really, it is INCREDIBLY simple to use, and any time I've had a question I've gotten a detailed answer within 24 hours. Hallelujah for simplicity! Thank the Lord for value! There are two great things about this software. It's simplicity and it's value. I am able to track the financial aspect of real estate investments without getting bogged down in hard to comprehend financial language. I was able to dive right in and get started with needing training or assistance. The value could not get any better as it is FREE for individual investors such as myself. This software is perfect for folks who are investing on the side and trying to grow a real estate rental portfolio. You can keep it simple with one property or take advantage of the room to grow the platform naturally provides. Stessa is easy to use and keeps things simple and straightforward. I like how I am able to quickly add transactions with the terms "Money In and "Money out". The Reporting function allows me to quickly get a snapshot as to whether or not my property is making money. Plus, it's easy to print those reports and hand them over to your CPA at tax time. I only manage one property right now, but it looks like I will be easily able to expand and add more properties over time. How great to be able to track them all in one place! Getting snapshot views of properties individually or as the entire portfolio is pretty darn great. Stessa is easy to use and keeps things simple and straightforward. I like how I am able to quickly add transactions with the terms "Money In and "Money out". The Reporting function allows me to quickly get a snapshot as to whether or not my property is making money. Plus, it's easy to print those reports and hand them over to your CPA at tax time. I only manage one property right now, but it looks like I will be easily able to expand and add more properties over time. How great to be able to track them all in one place! Getting snapshot views of properties individually or as the entire portfolio is pretty darn great. I manage a rental condo and I would love it if there were a transaction signifier for HOA fees. • Stessa helps track key metrics via visual dashboards and real-time data to make better decisions and manage investment outcomes. • Stessa's iOS mobile app leverages machine learning to capture, track, categorize, organize and scan property-related invoices. • Automated expense and income tracking solutions help consolidate transactions from property, banks, and loan management accounts. • Short-term rental and vacation owners can use Stessa to track performance via Pro Forma column and monthly expenses function. 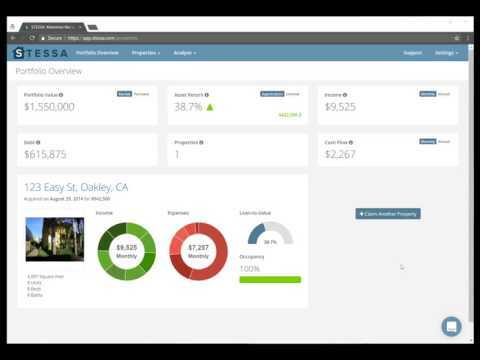 • Property managers can integrate AppFolio with Stessa to enable automated transactions. Below are some frequently asked questions for Stessa. Q. What type of pricing plans does Stessa offer? Q. Who are the typical users of Stessa? Q. What languages does Stessa support? Q. Does Stessa support mobile devices? Q. Does Stessa offer an API? No, Stessa does not have an API available. Q. What other apps does Stessa integrate with? Q. What level of support does Stessa offer?